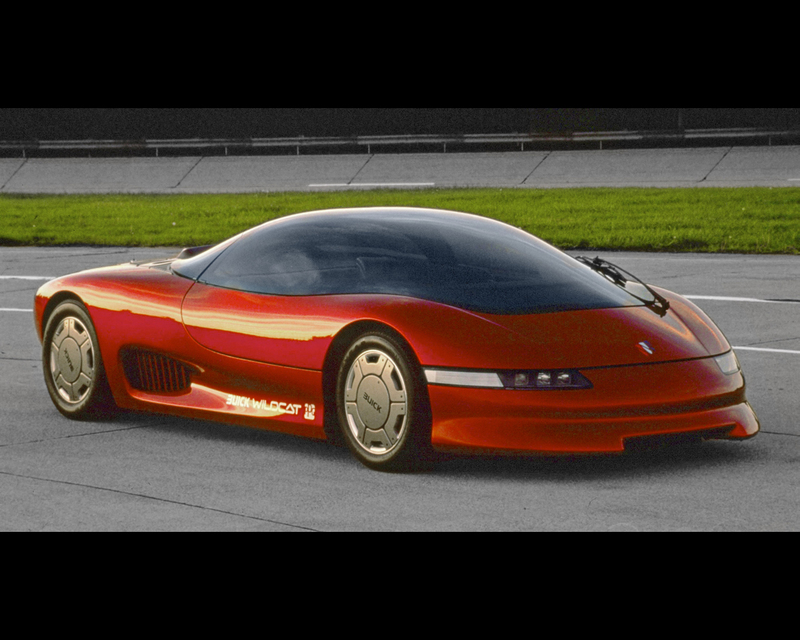 It took three years for the General Motor Design Center to develop the Buick Wildcat Experimental that was launched in 1986 for the USA Motor Show circuit. 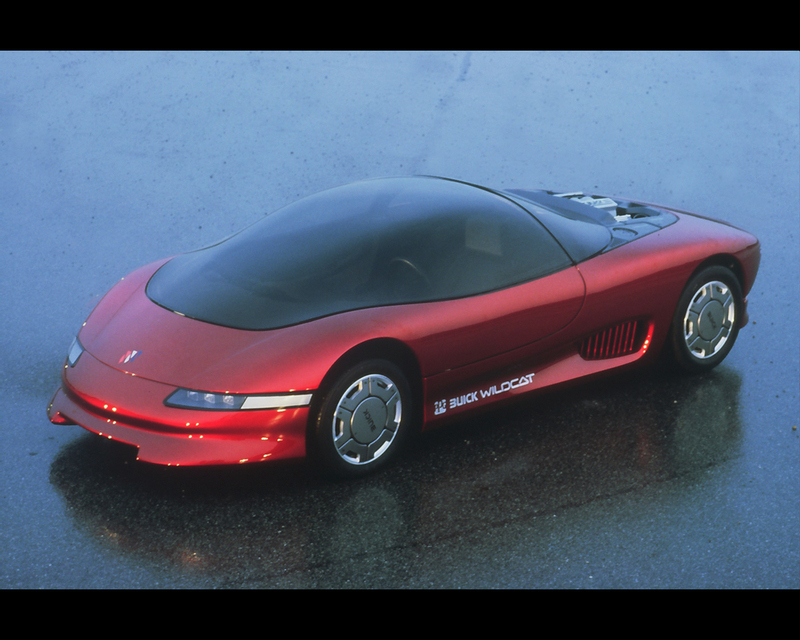 The Buick's concept car features styling so unusual that General Motors' Director of Design, Charles M. Jordan, at the time called it "one of the wildest cars we've ever designed." Charles M. Jordan described the Buick Wildcat as a unique blend of art and engineering, of flowing sculptured surfaces punctuated by exposed mechanical elements. The surprising contrast is most evident behind the passenger compartment where the top of the high tech mid-engine is exposed to view. 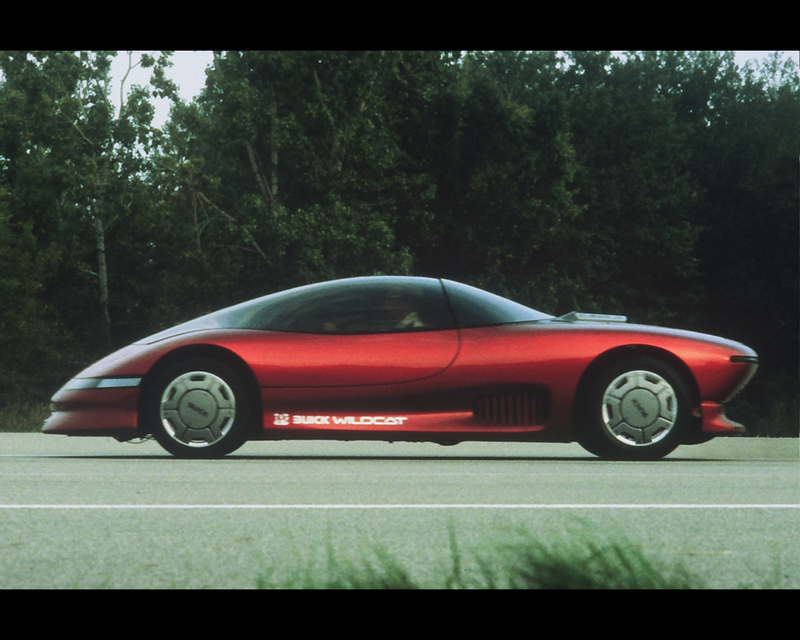 That's what Buick engineers were looking for when they asked GM Design Staff to develop Wildcat. 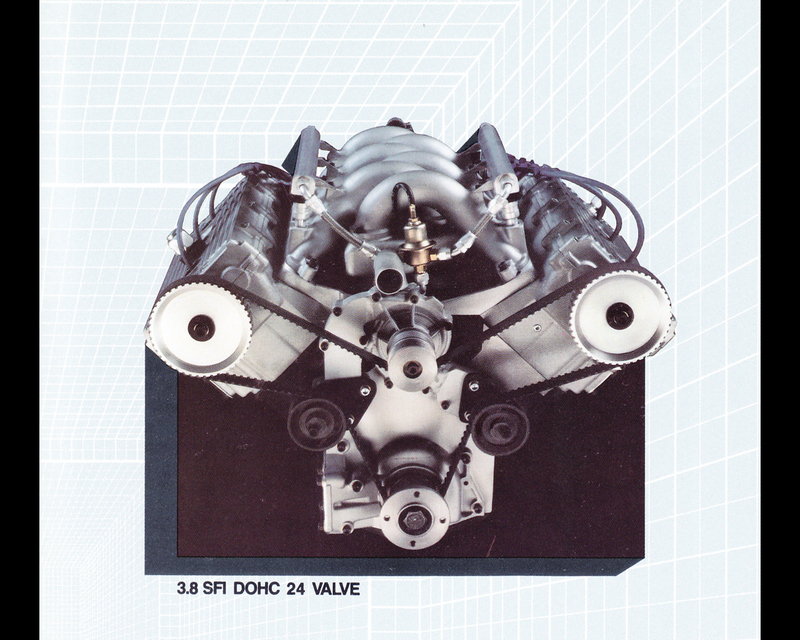 They wanted a concept car with specific mechanical appeal to emphasize Buick's new 3.8 Litre (231 cubic inch) dual overhead camshafts V6 engine with four valve per cylinder that would be launched through the Buick line of product. "We have never done anything like that before," said William L. Porter, chief designer of Buick Studio N°1. "Usually, our designs have minimized the mechanical elements. 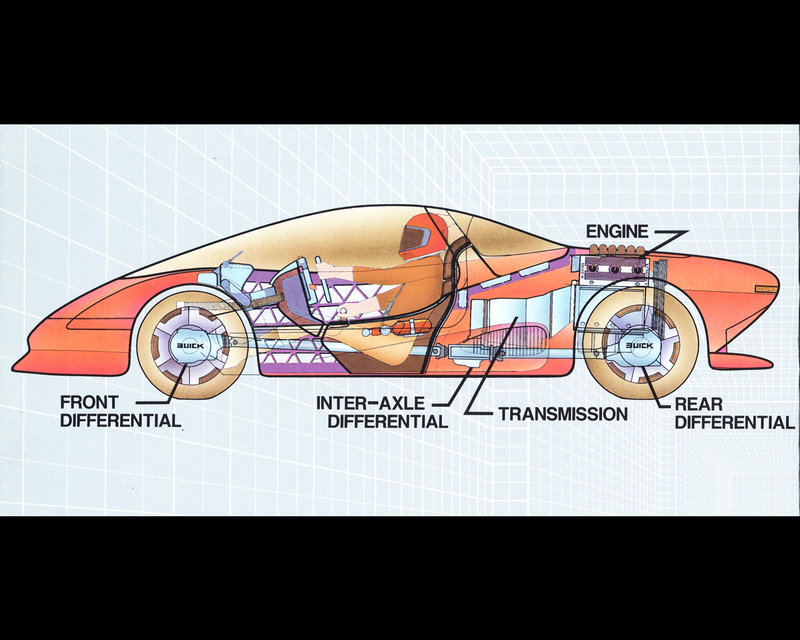 This notion of featiring mechanical component as part of the exterior design was a fresh idea, a dynamite idea for a concept car!" The Buick Wildcat was at the time a showcase of engineering innovation, ilcluding high-tech V6 engine with 24 valves, dual-overhead camshafts, field-programmable Sequential port Fuel Injection and a performance version of Buick's Computer Controlled Coil Ignition, with four-wheel drive, clutchless manual-shift automatic transmission and a cokcpit full of electronic instrumentation. In the summer of 1984, the project went to Porter's Buick Design Studio where David P. Rand, a young senior designer, made a drwing that caught Porter's eye. He showed it to Jordan. "I remember walking in to look at that drawing," said Jordan. "When I saw it, I knew that that was it. There was the theme we were looking for, a shape that pulled all the elements together." "The shape was a departure from the traditional GM profile of long hoods and short rear decks. The mid-engine arrangement, in fact, led to just the opposite: little or no hood as such, and a generous deck surface, the perfect place to showcase the engine." added Jordan. "Dave's sketch seemed to embody a successful expression of both muscular sculptural forms - like a crouching cat or a swimming shark- and the exciting mechanical aspects of Buick's latest engine technology," said Porter. "The Buick Wildcat Experimental has a lot of exciting design elements," said Kip Wasenko from GM's Advanced Design Studio. "The transparent canopy shape forms part of the front fender, the back light flows into the engine environment, and the ultra-high-intensity tail lamps and small high-intensity headlamps are in flush with the body surface." The sculptured interior design was developed by a group of creative designers working side by side with the exterior designers to assure a unified theme. Said Jordan, at the time: "The interior design is as exciting as the exterior. With the totally integrated interior compartment and the design of the controls and information center, the Wildcat is a preview of what's coming in future interiors." The Buick Wildcat Experimental has no traditional doors. As the canopy is raised, the steering wheel tilts upward for ease of entry. With the canopy raised, the driver or passenger sits on the low, wide sill and swings his or her legs into the compartment. The driver's seat is power adjustable and features inflatable lumbar and side supports. Buick's advanced electronics instrumentation is showcased in the cockpit. The primary instruments (tachometer and oil pressure, battery, fuel level and coolant temperature gauges) are housed in the stationary hub of the steering wheel. Various other displays reveal such information as "g" forces experienced in a turn; horsepower and torque; spark function for precise engine tuning; percent of tire slippage; low air pressure warnings for all four tires; direction of travel and oil temperature. 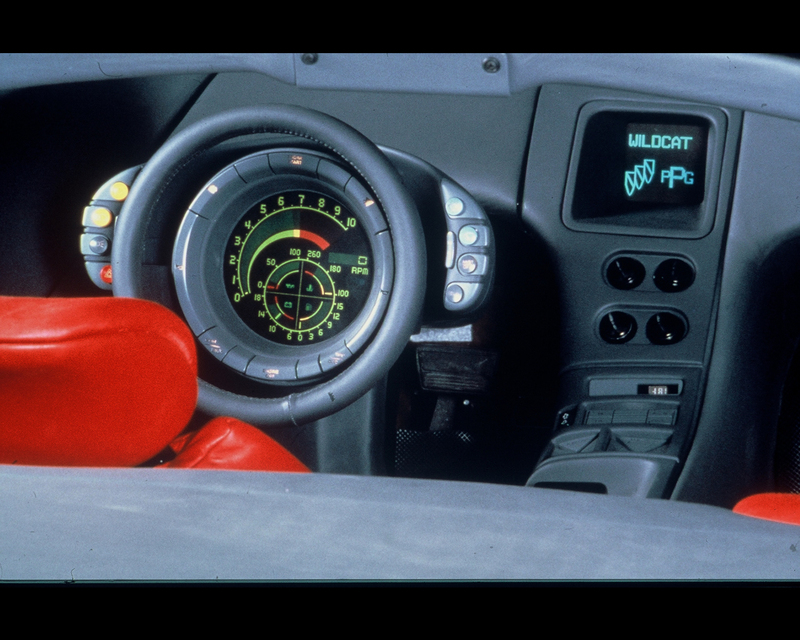 Four pair of switches surround the fixed steering hub within the circumference of the steering wheel: ignition start and stop, turn signals, horn, and trip odometer/metric conversion. Speed and gear selection are projected on a "heads-up" panel immediately in front of the drivers line of sight. The panel is transparent, and the readouts translucent, to maximize "eyes on the road" driving. Overall lenght of the Buick Wildcat Experimental is 4388 mm (172,75 inches), wheelbase is 2591 mm (102 inches), width is 1836 mm (72,28 inches), and height to the top of the closed canopy is 1109 mm (43,7 inches). Wildcat weighs 1320 kg (2.910 pounds). The structure of the Buick Wildcat Experimental is composite carbon fibre and glass. Front and rear steel crossmembers are bolted to the underbody.